More guest stars this week. We have Steve Murray (who is awkwardly kissing the edge of the pillar, which I feel is appropriate for his sense of humour), Jon McNally, Matt Smith (Not the guy who played Doctor Who, but the guy who’s got a great comic called Barbarian Lord), and CTON. I used to be a big fan of the band Kiss when I was in elementary school. I chose to ape Paul Stanley’s makeup in this strip because it’s an easy shorthand for rock and roll star. There is literally a star on his face. It’s a double whammy that an ocelot is wearing it, since the drummer wears cat make up. 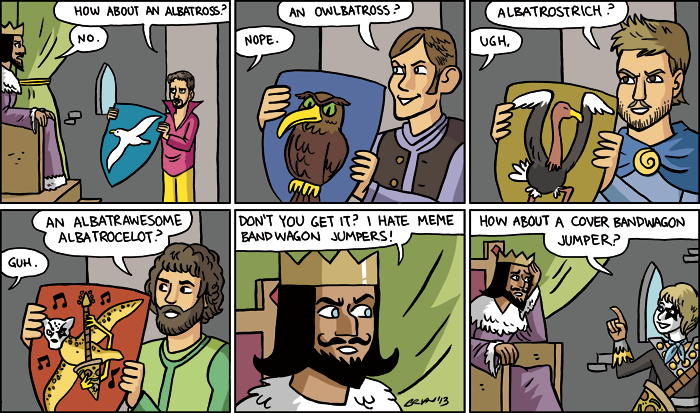 I think the reason I thought of the albatross was from studying Rime of the Ancient Mariner in the winter semester. It was that and Monty Python that really brought the bird to my attention. I like how you tied it back to the first flag strip. Ribuprissin – How’d I do that? In the first strip the king has an axe, and here the pun guy has an “axe”?